A forty-something non-gamer gets a PlayStation 3 and tries to get up to speed, reviewing games and posting random thoughts about the electronic gaming world. This should answer any questions you have about the difference between my gaming experience and The Bride's. About a week after we got the PS3 we hit a place right here in Marlton called Play N Trade. It was local and less expensive than a Gamefly subscription, and the staff was friendly and helpful - even to me. The Bride picked up The Orange Box, featuring Portal and Half-Life among a few other games. I got two older PS1 games (still compatible with the PS3) of old Atari 2600 game compilations. 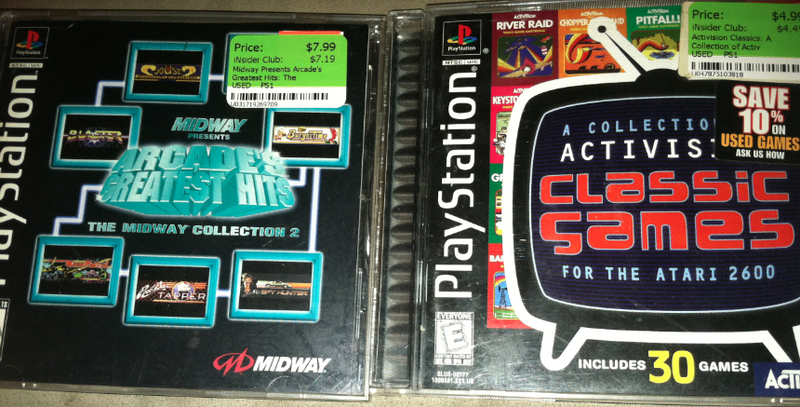 Specifically, I got Arcade's Greatest Hits: The Midway Collection 2 and A Collection of Activision Classic Games for the Atari 2600. Yep, that's about my speed. I feel so old. Even the guys behind the counter felt bad for me. When we got home, The Bride put her disc right into the PS3. As of this date, I still haven't even tried my two purchases. But from that moment on, until she actually finished Portal 2, I couldn't even use the TV. She was addicted. Thus is the power of Portal. I don't think she even ever looked at the Half-Life portions of the disc. The Bride is not a first person shooter type person, but more of a puzzle person. And apparently, while looking like the first type of game, Portal is really the second. In the game, you play a young girl named Chell who runs around on preposterous leg stilts to make jumping easier, and a handheld teleportation device. With this 'portal gun' you make holes in this maze complex to travel toward your objective. Your opponent in this quest is an annoying artificial intelligence named GLaDOS who keeps promising you cake. Over and over and over again. The Bride wanted this cake bad apparently because she played day and night, she played every waking moment, she played all the time it seemed. Even in my insomnia-rattled state, she was playing when I went to bed, and she was playing when I got up. And all the time, GLaDOS never shut up about that goddamn cake. I'm a PC gamer only (not having a tv, pretty much my only option is my computer), but I bought PORTAL on Steam last year when it was on sale. Hungry? Try my foodie blog, French Fry Diary here. Wanna talk? Hit me up here.